The Muslim should sit where he finds a place in the masjid. It is important to be respectful when entering one of ‘Allah’s houses’. When a person visits a masjid/mosque for the first time, it is often very daunting. You know that there must be many rules, customs and etiquettes, and you don’t want to offend anyone or break any rules, but it takes time to learn what these are. What we present here is not an exhaustive list of such things, but hopefully we can explain some of the main things to be aware of. If there are any mistakes, or if you have anything to add to this guide, please let us know. 7. Be considerate about your personal hygiene. One hadith says, “Whoever eats garlic, onion, then keep away from our Masjid because the angels get offended from what offends the children of Adam.” It is reported that if the Prophet Muhammad (peace and blessings of Allah be upon him) found a man to have a strong smell upon him, he (peace and blessings of Allah be upon him) ordered him to be taken out. So it is something that should be taken very seriously. 9. Do not walk directly in front of a praying person. This is one of the most common blunders of the newcomer! According to a hadith, “If the passer in front of the praying person knew how much sin he committed, it would have been better for him to wait for forty years than to pass in front of him.” On a related note, worshippers often place a scarf or other item a short distance in front of them as a ‘marker’ – treat this as their inviolable space while they are praying. If it is absolutely necessary for you to pass in front of them, do so in a manner that your back is facing the praying person. 10. The Muslim should sit where he finds a place in the masjid. The Muslim should not skip people or squeeze himself between two people who are already sitting. To aid people who come when the masjid is busy, those already sitting should try to make space for them. 11. When a women is experiencing her monthly cycle, it is forbidden for her to enter the masjid. 12. Do not engage in trade in the masjid. The Prophet Muhammad (peace and blessings of Allah be upon him) said “If you see some one selling or buying inside the Masjid, say to him: May Allah not make your trading profitable. And if you see someone crying out inside the Masjid something he has lost, say to him: May Allah not restore it to you, for the Masajid were not built for this.” More generally, try to avoid devaluing the purpose for which you came by speaking of worldly affairs. 14. Greet people when you enter, and when you leave the masjid. The Prophet Muhammad (peace and blessings of Allah be upon him) said “When one of you joins a gathering he should greet those present; and when he leaves them he should greet them because the first salutation is not better than the last one.” If there are many people present a single declaration of ‘As Salamu alaikum’ will suffice, as this means ‘Peace be upon you (all)’. 15. 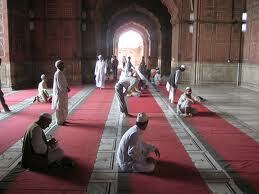 Do not sit with you feet pointing towards the Qibla (direction of prayer) or other people. 16. It is generally agreed that the Qur’an should not be placed on the floor out of respect for the divine word, although there are some groups that do not adhere to this. 17. If men and women should meet in the masjid, they should not shake hands! Such physical contact is everyday in Western society, but is inappropriate in Islam. There are, relative to Western norms, strict dress codes in Islam. Make sure you dress modestly. For men, this means, as a legal minimum, being covered from navel to knee, but more dignifiedly the top clothing should cover the elbows. It is also good practice for men to wear a hat. For women, the majority of opinion is that only the face, hands and feet should show. You should also avoid wearing clothes with pictures of faces on them.